In any industry, its easy to get bogged down with jargon without fully understanding what it means and its benefit to you. We believe it is essential for hoteliers and industry professionals to understand the meaning of RevPar and ADR (Average Daily Rate) in order to be able to measure and analyze the evolution of these key metrics and adjust strategy accordingly to boost revenue. RevPAR, or revenue per available room, is a performance metric in the hotel industry that is calculated by dividing a hotel’s total guestroom revenue by the room count and the number of days in the period being measured. One of the most important things for a hotel, like any business, is to make a profit. ReviewPro’s objective is to help you profit from Guest Intelligence, increasing your RevPar and ADR. Research undertaken by Cornell Hospitality Research confirms that online guest satisfaction has a direct impact on the financial performance of hotels. Conducted by Associate Professor Chris Anderson, the study shows that a 1-point increase in a hotel’s 100-point ReviewPro Global Review Index™ (GRI) leads up to a 0.89% increase in price (ADR), a 0.54% increase in occupancy, and a 1.42% increase in RevPAR. By accurately tracking your online reputation scores, you can monitor how your hotel is ranking in terms of guest satisfaction. 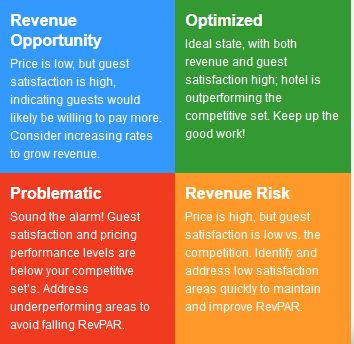 ReviewPro’s Revenue Optimizer allows you to identify opportunities to increase ADR & RevPar through the evaluation of the relationship between a hotel’s online reputation and historical pricing performance relative to competitors and identify opportunities to increase financial results. For more information on how to measure your online reputation performance and use insights to increase your ADR & RevPar, you can request a free demo from one of our Guest Intelligence experts here.